I just got home from watching an Opera. I'm really tired right now and all I want is just drop in my bed and sleep. But this news that just came in is so exciting that I regained adrenaline just to post this one. Warner bros. has revealed the very first poster of the Yogi Bear movie that features both Yogi and Boo Boo in CGI. 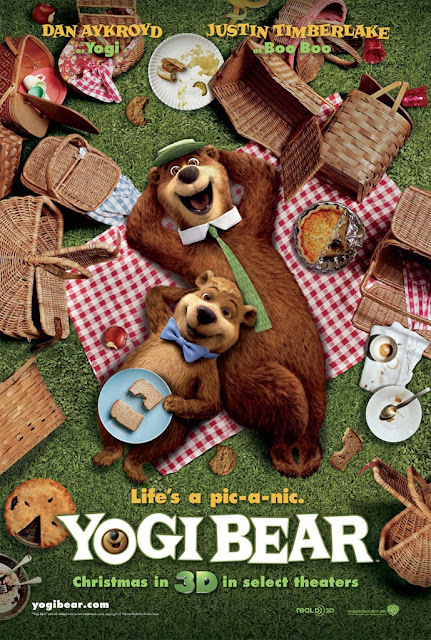 The poster is so cute and I feel a hint of nostalgia since Yogi is already considered a classic cartoon figure. Yogi will be voiced by Dan Aykroyd and Boo Boo will be voiced by the pop star Justin Timberlake. The movie will also be joined by human characters played by such names like Anna Faris, TJ Miller, Tom Cavanagh, and Andrew Daly. I also heard that tomorrow 7:00pm EST (7am in Philippines/Singapore), the first trailer will be released. The poster looks cute but the trailer will be the last judgement. Will watch out for it later. Yogi Bear is to be directed by Eric Brevig and set to premiere onDecember 17, 2010 in US. The film will be distributed worldwide by Warner Bros. Pictures, a Warner Bros. Entertainment Company. Hahaha, he will be doing some Boo Boo voice. It is hilarious but I think he pulled it right.